The first Nano Meet of 2017 is not far away and you can record your names on the Nano website (link below) if you would like to attend, all owners are welcome whether you have been to many meets before or you are just starting out. If you have a love for the 75/ZT there will be plenty of free maintenance advice and ideas for modifications maybe you want to add to your car. March can be a funny month weather wise, we have in the past been snowed off, but last year all was fine as below, so fingers crossed. 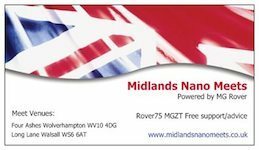 Midlands Nano Meet Weekend Sat 18th & Sun 19th March 2017. Hard to believe it has come around so quickly, I won't be able to make this one. Looks like you are going to have reasonable weather so have a great weekend all you Nanomeeters. Great Start to the 2017 meets hopefully all the others will be just as god if not better, nice to see a few new faces also, which I think will be returning from talking to most of them.